It´s all relative but all sports mostly fall on the category of ¨Contact Sport¨. Basketball´s contact happens when you try to steal the ball and fouls are called when arms are touched or even when hands are slapped. Football, on the other hand, has fouls where if you accidentally hit the foot of the enemy rather the ball. It´s a sport that has minimal padding compared to American Football where the goal is to charge like a bull against your enemy to stop them from advancing. So imagine that analogy but take away all the padding that can protect a human being. A foul is called in rugby when you tackle above the shoulders, that´s it. So when they slam to the floor most of the time, there is no comfort to protect their bodies or their heads from whiplash. it´s common sense honestly. American Football players have padding like armor to protect them for the whole game. 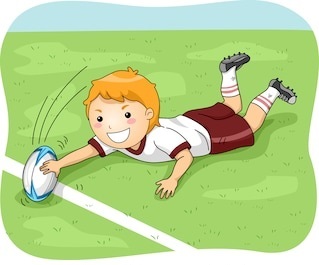 Rugby does not so in that point alone, it´s a no-brainer unless you want your children to have the risk of brain damage. Rugby ranks one of the highest in contact sports injuries. Muscle strains, wounds, bruises, fractures, dislocated bones and more. It would actually be safer to enroll your children to mixed martial arts because, in practice, full contact is not really recommended. There is a guide that coaches your children and makes sure they are not just striking each other with no knowledge of the consequences. Rugby is played in your parks and it sure looks like there is no guide for your children when they engage in this sport. In conclusion, we totally agree that allowing your children to play Rugby is dangerous for their health. The injuries, lack of technical knowledge and lack of protection just put your children in risks of too many negative consequences. It is best to teach them the other elements in Rugby like conditioning, cardio and strength exercises first before letting them play a full-contact sport.